Microsoft might be done with making wearables of its own forever. 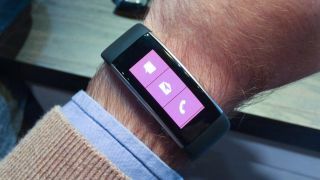 ZDNet's Mary Jo Foley reports that Microsoft has no plans to release a new Band fitness tracker this year. What's more, the company has supposedly dissolved a team of engineers tasked to getting Windows 10 running on the existing Microsoft Band and Band 2. Meanwhile, on the surface, Microsoft instated a deep discount on September 2, bringing down the price of the Band 2 to $175 (about £130, AU$230) from its original retail price of $249 (£199, AU$379). Typically, price cuts happen to clear out inventory for next generation devices or an ultimately discontinued device, so it could still go either way. However, given the difficulty Microsoft has been running into with devices that split completely or tear apart at the seams, the company has enough reason to step out of the wearable world. Microsoft has only officially stated that it will "continue to sell Microsoft Band 2 and remain deeply committed to supporting our customers and exploring the wearables space." Instead of producing the next Band 3, Microsoft might be focusing on improving its software as it has also stated "we continue to invest and innovate in the Microsoft Health platform, which is open to all hardware and apps partners across Windows, iOS, and Android devices."